We’ve instituted some common-sense practices on the farm that have enhanced our farm ecosystem. Cover crops such as rye, wheat, oats, vetch, clover, field peas, and buckwheat play a key role in our growing season on the farm. It has taken us a while to learn the unique characteristics and qualities of each, so that we know when and where to use each one. At right, Eve and baby Forest (1 year old) sit in a swath of spring oats. Many of these cover crops also end up in our flower bouquets, and sometimes salad mixes as well! The clover we planted between vegetable beds is nearly up to Chris’ knees by June. Then we run our pastured flock of laying hens through it, and they eat up all those little leaves while leaving behind delicious yellow eggs for CSA members and manure to further enrich the soil. At right is a photo of three of our favorite cover crops working together in synergy. Rye, the tall stalk in the center, is planted in the fall and keeps the soil from eroding during the winter when winds and rain are strong. 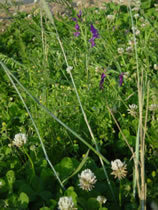 Vetch, the leguminous vining plant in the photo with purple flowers, grows fast in the spring, climbing up the rye stalks, fixing nitrogen, and adding organic matter to the soil when it dies. White clover, blooming below, provides long-term dense cover, fixing nitrogen while crowing out weeds. 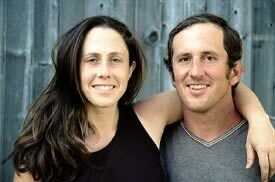 We brought 3 beehives to the farm in 2005, and added 2 more in 2006. We’ve left most of the honey for the bees to use, and are mainly trying to keep the hives healthy, learning about beekeeping as we go along. Their work as pollinators helps out many of our crops, especially cucurbits like melons and pumpkins. Bees are rapidly disappearing from this country due to introduced diseases and pests, as well as damage from chemical pesticides. We’re happy to do what we can to bring them back. 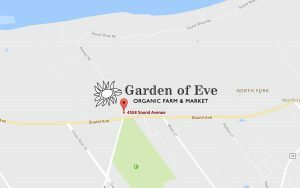 Widlife is plentiful at Garden of Eve. Some animals cause a lot of damage to our crops unfortunately, because their populations are out of balance on a regional scale, like the white-tailed deer shown below. We also have a lot of problems with racoons eating our chickens. We’re proud that many animals that are rare in our region feel comfortable enough on our farm to make it their home. Wildlife species we see include Eastern Box Turtles, Scarlet Tanagers, Woodcock, Red-Tailed hawks, Harriers, Osprey, Great-Horned Owls, Saw-Whet Owls, and once even a Golden Eagle. We also see salamanders, snakes, skunks, opossum, voles, and lots of cottontail bunnies. Lady-slipper orchids turn up once in a while in our woods, as well as wild blueberries, striped wintergreen, and lots of poison ivy (not rare). As an organic farm, obviously we don’t use chemical pesticides. Remember that if we’re growing a crop, it’s probably because it’s delicious – and there are many types of insects and critters who would like a seat at the table! 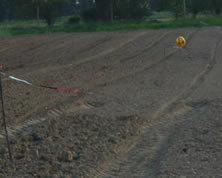 To make sure we have some vegetables left for our customers, we have to get very creative during the growing season. Many years, we’ve been very disappointed to plant a whole field of beans… and have barely any plants sprout, because all the beans got eaten by birds right out of the dirt! These shiny banners and huge “eyed” balloons are supposed to scare away crows that want to eat bean seeds we’ve just planted in this field. After beans sprout, we still have to keep worrying that these tasty plants will be eaten by rabbits, deer… you name it. We have a barn cat, who tries to keep the mice and rats out of the greenhouses and barns. We’ll be getting some Maremma livestock guard dogs as well in 2007. Go to our “Farm Animals” page to read more about the role animals play in our farm ecosystem. Cloth “row cover” (a material called Typar or Reemay) tucks in beds of baby greens and zucchini in the spring. This keeps the flea beetles from making lace out of little lettuce leaves (say that five times fast) and creates a nice warm micro-climate that helps speed up growth, especially on cold April and May nights.